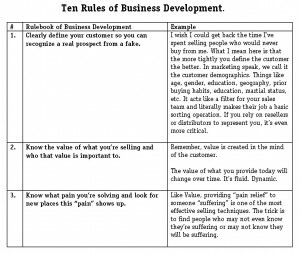 Why the topic of the Ten Rules of Business Development? It’s the subject CEO’s consistently rank as being “of greatest concern” according to The Conference Board’s annual research report. Regardless of business size, “Sustained and Steady top-line growth” was ranked as the #1 business challenge. For small businesses, 60 percent of the surveyed CEO’s put it on the top of the list. In my world, the quest for new business growth (and it is a “quest”) falls under the heading of Business Development. And in order to do it well, Marketing and Sales have to be on the same team. It’s the principle reason I wrote Marketing Playbook: The Definitive Guide to B2B Marketing. Not only does Marketing and Sales lack a common language, they often don’t understand their assignments, that is, who’s supposed to what, when. So, what are the Ten Rules of Business Development? Clearly define your customer so you can recognize a real prospect from a fake. Know the value of what you’re selling and who that value is important to. Know what pain you’re solving and look for new places this “pain” shows up. Lumpy marketing is a reality for most businesses. Know your Solution Leverage and find markets you can command. Download my 3-page PDF to get examples for each of the ten rules. No registration necessary…just click. How does this tie into your book? My book provides the tools and ideas for making the task of Business Development easier. Why are you qualified to speak on these topics? I’ve been a business developer since 1979 when I started by career with Intel’s new business development sales division. We were to open new doors for our technology. I’ve spent my career—and to this day—finding new revenue sources for my customers and even my own business. I’ve been the recipient of marketing going in one direction and sales going in the other. Sadly, the byproduct of this conflict is a waste of time and money and the birth of rogue sales. It’s a reality in business today, but it’s unnecessary—and avoidable. I am one CEO who doesn’t accept it. Here’s a fact: Business Development is not just selling. Business Development is all about opening new doors, forming new partnerships, establishing new channels of distribution. Think of it this way. Marketing shines a light on the customers and prospects the company wants Sales to sell to. Business Development, on the other hand, uncovers the sales opportunities out of the spotlight. Putting this all together is a very powerful combination.